Judy's Doll Shop | Alice In Wonderland - "Painting The Roses Red"
Alice In Wonderland - "Painting The Roses Red"
She stands 16 inches tall, and is made from the most unique felt wool.. 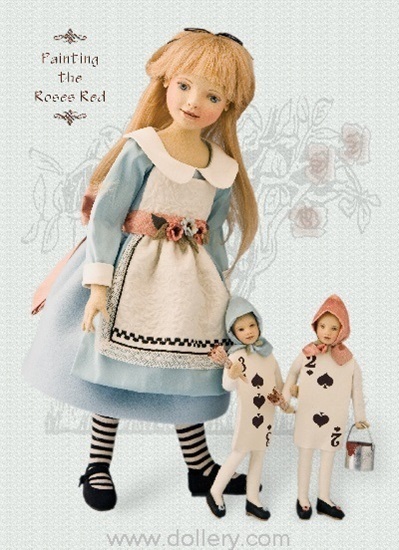 Dressed in a blue felt silk wool dress, Alice stands 16 inches tall. She is made from a wool felt that is completely pose-able using her own unique ball jointing system on the market. The moveable heads and wired fingers allow the dolls to have great expression. Her blonde hair is human hair and is tied back from her face with a little black bow. Her apron is cream felt, pressed in a mold to emboss an ivy pattern that is embellished with black embroidery and cream colored lace. The salmon colored silk sash around her waist ties in a big beautiful bow in the back. Black and white stockings, and black mary janes complete her adorable ensemble. She is accompanied by two felt cards made of felt with posable arms and legs.